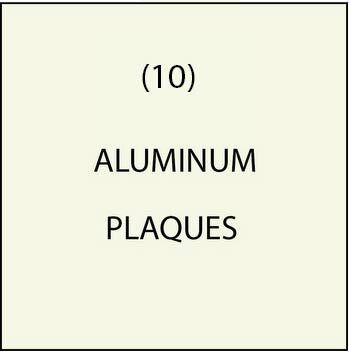 This section shows our aluminum signs & plaques. These are of two types:(1) thin aluminum sheet cur-outs for cladding on the letters, borders or art of 2.5D wood or HDU signs; and (2) solid aluminum 2D plaques, with text, art and borders etched by sandblasting , left natural or sometimes painted. The rest of the aluminum plaque is left with a natural shiny surface. These solid aluminum plaques are substantially less expensive than the carved HDI and wood plaques in the remainder of this Gallery 7.